Fresh, easy, and pretty enough for a party this colourful salad tops our list of go-to recipes for a perfect side dish for a summer. With the bounty of crisp cucumbers and tangy tomatoes this in one of our family favourites. It’s crisp & cool salad perfect for a hot summer day. 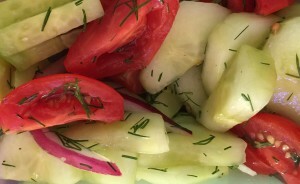 This cucumber tomato dill salad will become your go-to recipe through out the summer for backyard barbecues, family gatherings or picnics at the beach. With ingredients available year round it’s the perfect side dish and it will look like you spent hours preparing in the kitchen. 1. In the bottom of a large bowl, whisk together the vinegar, sugar and salt. Toss in the cucumbers, red onions, tomatoes and fresh dill. Most importantly it’s Mom tested and kid approved. Have you tried this salad before? What ingredients would you add to make it even better? I would love to hear about it in the comments below. What’s your favourite go-to salad? This sounds delicious! I just got some cucumber for a vinegar mix, so I may have to throw in some of our ingredients, too! This looks like a tasty salad. We have so many cucumbers ripe – perfect way to serve them for supper. That is a great salad. Looks so fresh and tasty. Such a perfect Recipe for Summer! I like how light and easy the instructions are to follow. This would do well at a Grill or Barbecue. Nothing says summer like a cucumber and tomato salad, it used to be my grandmother’s favorite drizzled with olive oil and apple cider vinegar. This is the perfect salad right now! I have so many tomatoes and cucumbers sprouting out of my garden right now we are having a hard time eating them all! This is a great way to enjoy them! I LOVE cucumbers and have been looking for a good way to eat them. This sounds so yummy! I guess I should stop at the produce stand on my way home from work tomorrow. This sounds delicious and refreshing. The perfect healthy summer salad! This sounds delicious! I have plenty of tomatoes growing in my garden this year so I’ll definitely try this! That sounds like a nice refreshing salad for the summer and especially for picnics! Great for the holiday weekend too! Such a perfect salad for summer – it looks super delicious! Those are summer flavors. Together I imagine they make for a a very happy and light lunch or dinner salad. I love a good salad. I especially like them when it is hot outside. They are cool and tasty. Cucumbers and tomatoes make the best salads in my opinion. This one looks real good! Yum! I will be saving this for when we get our cucumbers from the garden. Wow I could probably eat that for lunch every day. I’d love to make a bunch of this as a side! This sounds amazing! I would love to do this recipe and bring it at a BBQ this summer! I was just thinking of something to make with dill in it. That’s my fav herb right now. That sounds absolutely delicious. What a perfect summer lunch! This sounds great! I am sure my hubby and kiddos would absolutely love this! I will have to try! We love cucumbers and I like that this is quick and simple, but also super healthy! I love cucumber and tomato salad, it’s such a great summer side dish. Your addition of dill sounds fabulous, I feel like dill is such an underutilized herb! 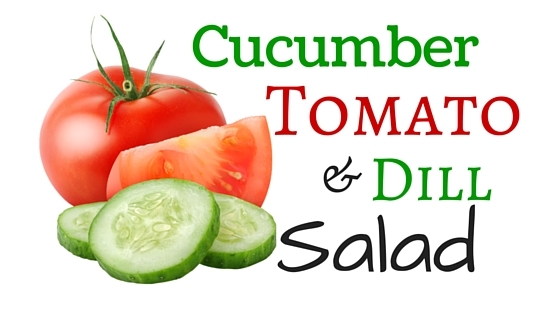 I love cucumber and dill together and will have to try the addition of tomato! This looks like a perfect summer snack that is good for you! Oh my what a refreshing and light salad, I love a good salad in the summer.